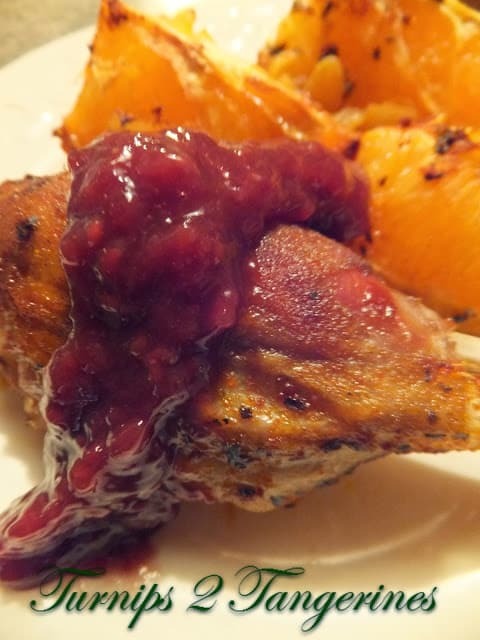 Spicy Roast Duck with Cherry Sauce is super delicious. There are several steps to this recipe but the extra effort is well worth it. The first step or flavor layer is to make a dry rub. 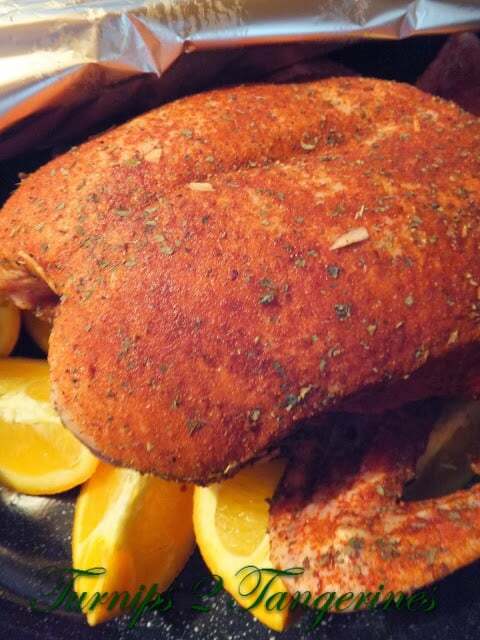 The dry rub, made with 10 different dried herbs and spices, is rubbed over the entire duck before roasting. 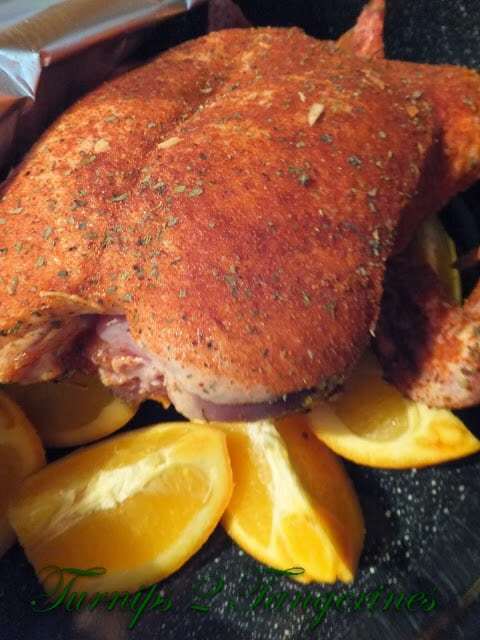 The second flavor layer is twofold, shallots and whole, peeled garlic cloves are placed inside the duck cavity and the duck is then roasted on a bed of orange wedges. Now, on to the cherry sauce. Didn’t I say this duck recipe was well worth it!! For those of you who aren’t fans of duck or live in an area where duck is considered “seasonal,” you can still make this recipe. Replace the duck with a large roasting chicken, a whole turkey or turkey breast. If your fortunate enough to have a hunter in your family and can supply you with fresh game fowl then you’re in for a real treat. 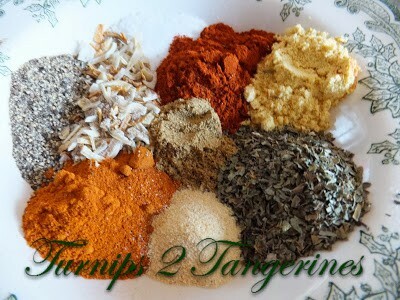 The dry spice rub makes a fair amount, enough to sufficiently cover a duck, large roasting chicken, turkey or even several Cornish game hens, quail or pheasant. The third layer of flavor in this recipe is the cherry sauce. 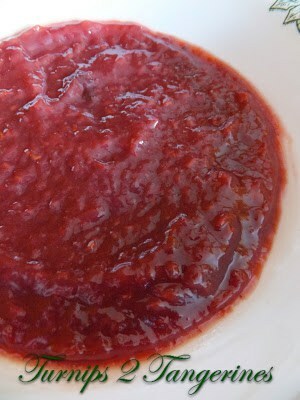 The sauce is made extra special with Door County Cherry De-Lite Preserves. Cherry De-lite preserves is made with Door County cherries. The cherries that made Wisconsin famous. If you’re unable to find cherry de-lite preserves, use your favorite brand. You can also order cherry preserves online. This recipe is the perfect opportunity to make the duck, chicken or game bird used in this recipe into what is called “spatchcock.” Spatchcock is an older cooking term that’s recently come back into culinary “vogue.” The term means basically to split a bird down the back, then opening out and flattening the two sides like a book. It’s similar to the term butterfly. Spatchcock refers to only fowl, whereas butterflying applies to boneless cuts such as meat, poultry, fish and so on. In other words, a bird that’s split and spread in preparation for roasting or broiling. Heat oven to 400º Blend all dry rub ingredients together. In a roasting pan place oranges. Put shallots and garlic in duck cavity. 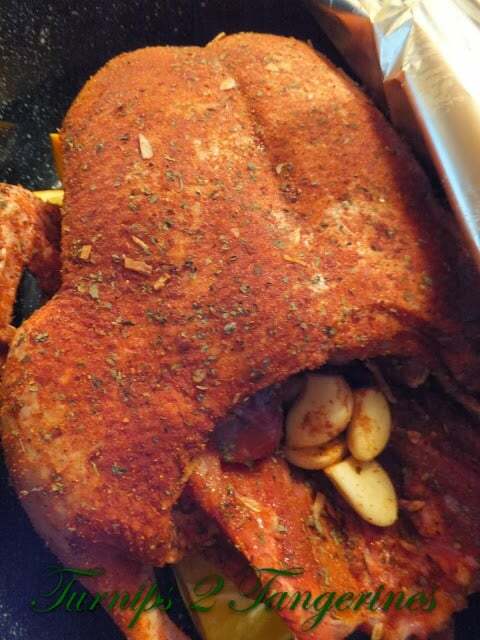 Dust the duck with dry rub seasoning. Cover the pan with heavy duty foil. Bake at 400º for 2-1/2 hours. Mix together cherry preserves, sugar, water, orange juice, and cranberry juice in a 2-quart saucepan.Stirring constantly, bring mixture to a boil. Reduce heat, simmer 10 to 15 minutes. Mix together the teriyaki sauce and cornstarch. Add to raspberry jam mixture and heat until thick. Uncover duck, drain excess fat in bottom of roaster. Baste duck with sauce and cook 45 minutes longer, uncovered, basting with sauce every 10 minutes. Left-overs make a yummy sandwich. German Christmas Stollen is a fantastic holiday recipe. Christmas just wouldn’t be the same without German Stollen! Oh Yum! We had Duck at Christmas this year! Thank you for linking at Show Me Your Plaid Monday's!!! You have been Pinned! I did not realize I wasn't following you on GFC! I should be on that, Bloglovin and Pinterst now. 🙂 Although I'm not a fan of spicy foods I have to say that duck looks pretty good! Hi Lynn, Happy New Year! This looks so delicious!